In 2003 I experienced many highs and lows. Of course if you follow my blogs and Facebook posts you know that I became a widow in December 2003. But earlier that year I participated in a protegé program that had me travelling across these United States meeting talented and inspirational people. One these individuals is Dr. Mawiyah Clayborne. This morning I pulled from my book shelf her book, “How to Remember Your Bliss”. When I opened to the title page, I was met with these words, “Deborah, Your loving & heartfelt contribution made this book possible!! Thanks & Congratulations! Mawiyah 8/03 [with a heart]”. Now that brought a smile to my face and a warm feeling in my heart. During that time, as my husband was battling cancer, I was seeking my place in the publishing business. Donald had supported my efforts from the very beginning and he did not want me to give up and sit home to care for him. He actually didn’t need my physical presence, what he needed was the love and support that encouraged him to get out of bed each morning and do something productive even as his health was failing. He was my biggest cheerleader. During this time, I did not have a close relationship with Jesus as I do today. My spiritual health was being fed by television and radio evangelist; and reading scripture and study materials on my own. I have a very open worldview of Spirituality. Dr. Clayborne’s spirituality came from her 30 year followings of Maharishi Mahesh Yogi. She gave him credit in achieving her spiritual foundation. We came from two different spiritual foundations, but we connected as friends. 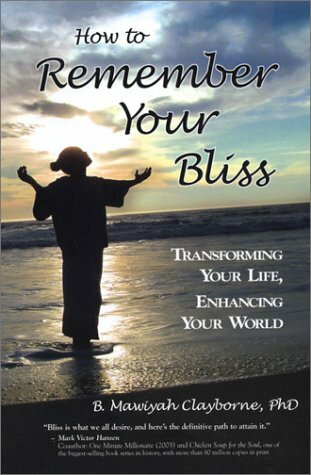 I am one of the many contributors in her book, “How to Remember Your Bliss”. At that time, I was working with young aspiring writers and my essay was based on the sheer joy I received working with them at Creative Performing Arts High School in Camden, New Jersey as their Publisher in Residence. Ten years later, I am still inspired to dream and write; also gain great joy as I work with other writers whose dreams are to be published. Although I am no longer a traditional publisher, I am still in the publishing business. I help individuals who choose to self-publish and need the technical and business skills that I bring to the table. My blissful moments come when they receive their first draft and ultimately their finished book. As a lonely middle child, I always feared that when I died, no one would remember that I walked this earth. But, as I look at the books that I helped birth, I am blissfully satisfied with my choice in life to be an author and publishing consultant. I want to acknowledge that Mawiyah played a very important role in my life. I thank her from the bottom of my heart for her spirit and bliss. Her quiet soothing manner helped me stay focused on continually finding ways to live a bliss-filled life. Her book is still available on amazon.com.